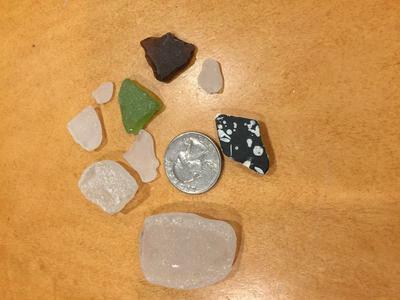 Spent a little over an hour and found approximately 8 pieces of nicely frosted and smooth sea glass and one interesting piece of pottery. The park was closed so I could not park in the lot. There was one space and two handicap spaces that are available year round. Bathroom facility was also closed. It was almost high tide when I visited but I was just happy to check the place out. I also checked out Jasper Beach (only 15 minutes from here) and found some unique rocks that will take a nice polish in the tumbler--no glass there though.. Visited on October 26, 2018.